Patriarch Youssef Dargham El Khazen is also known as Ibin Fayyad (Son of Fayyad) or Abi Kanssouh Ibin Abi Nawfal (Son of Abi Nawfal) Nader El Khazen. Patriarch Dargham was mostly known for being a strong and brave man, who handled his sword and riffle with deadly efficiency. His heroic stories span all across Lebanon, and the most notable incident happened back in 1704, when he was sent to reclaim the Maronite Patriarch’s honor. Here is a short summary of what happened on that year based on testimonies from historical books and references. In 1704, a group of Muslim Shiite Sheikhs (Known as Hamadiyyin) headed towards Deir Annoubin in Bcharreh to meet with Maronite Patriarch Estefan Doueihy and ask him for a large amount of money. The Patriarch did not comply with their demands as he did not have the money and as a result was assaulted physically by Sheikh Issa, leader of the Shiite Sheikhs, and then cursed and humiliated publically. After the assailants had left, Patriarch Doueihi dispatched a letter to Cheikh Hosn El Khazen informing him of the incident. Upon reading the letter, Sheikh Hosn became furious and quickly ordered his brother Sheikh Dargham and two of his relatives Sheikh Moussa Tarabay and Cheikh Nader Abou Khater to gather an army of 400 men and capture those who dared disrespect the Maronite Patriarch. Cheikh Hosn was the son of Fayyad aka Abi Kanssou, grandchild of Abi Nawfal, and whose father occupied many important positions during the rule of Prince Maan. Cheikh Dargham led the 400-men army and captured in no time those responsible of humiliating the Patriarch and dragged them all the way to Deir Annoubin and forced them to kneel and apologize in front of the Maronite Patriarch. "As2alouka ya mawlay 2an taghfira li zallati wa la tantakil ila keserwan ..."
Nevertheless , and in order to keep the Patriarch safe and well protected, el Khazen family secured Patriarch Doueihy’s transfer to Keserwan where they honored and protected him at all time. Cheikh Dargham was known to be a powerful and feared man, but also led a happy marital life with his wife and son Milan. However, upon his wife’s death, Dargham decided to become a monk and joined a monastery in Rayfoun. He came to be known as Youssef. After having served for many years, he was appointed as Ghosta’s Maronite Bishop in 1728 by Patriarch Yaacoub Awwad. During his rule he proved to be a very active, loving and daring bishop. Yaacoub Awwad, the Patriarch who promoted Youssef Dargham to Bishop 1728, died in 1733 at the Mar Challita monastery, leaving the Patriarchal position vacant. 1 vote for a fourth candidate. This outcome resulted in a major dispute between the bishops and the rumors spread on potential bribery added fuel to the fire. This series of events led the bishops to responsibly call for a public voting as explained previously in order to avoid potential divisions within the Church and strives among its sons. The winner of the public voting was Youssef Dargham, who was highly perceived as a responsible and powerful bishop, of a renowned and wealthy family. Upon his election, Patriarch Dargham appointed Maronite monk Abdallah Srour to be The Maronite Church’s representative and messenger to the Vatican. Few days later, a letter was dispatched to Rome stating the details of the elections and requesting Pope Clement XII’s approval and blessing. Here are few excerpts of the letter Pope Clement XII sent on April 1734 to Youssef Dargham, the newly elected Patriarch of Antioch for the Maronites. “To my respectful brother, one consecrated with peace and apostolic blessing, we were very delighted to hear about your election as Patriarch, whose mission is to bless and protect the Christ’s loyal servants, from bishops to priests, and all the whole ecclesiastic body as well as the Maronite people. We have received with utter gratitude and pride the letter your loyal servant and monk Abdallah Srour, from the order of Mar Antonios monastery, has delivered asking for our blessing and approval. Given that you’ve fully fulfilled your duties towards God, the Catholic Church and its pope, we hereby bless your election and will take no time in sending our written clearance. Rest assured that the Church will always be looking after you and taking care of you, as such care will never cease to exist with the presence of God. As a means of showing our fatherly compassion to you and your people and all the believers in the neighboring countries, we hereby give you the apostolic blessing” (Dated 9 April 1734). 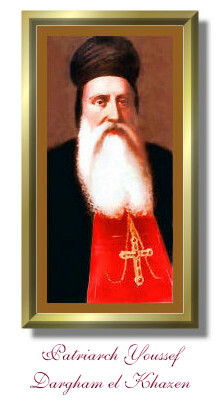 I, Youssef El Khazen, Bishop of Ghosta, the newly elected Patriarch of Antioch for the Maronites and head of the Maronite Church to which I have been always loyal, will be a loyal servant to Peter the Great, Jesus Christ’ ancestor and his blessed church, and to his beatitude Pope Clement XII and his successors.